Someone commented the other day that they were disappointed Scotland! contained no recipes. He has a point. One which I’ve been addressing. You may have noticed the odd Scottish recipe appearing in amongst those for Mild or from the 1950’s. That’s because I’ve been working on three books simultaneously: the new edition of Mild!, Victory! and Scotland! vol. II. So far I’ve written 60 new Scottish recipes. Nothing nearly like enough. I’m aiming for at least 200. I hope that they’ll open people’s eyes to the real nature of Scottish beer. No long boils, normal fermentation temperatures and roast barley nowhere to be seen. And plenty of hops. Younger’s No. 1 is a good example. 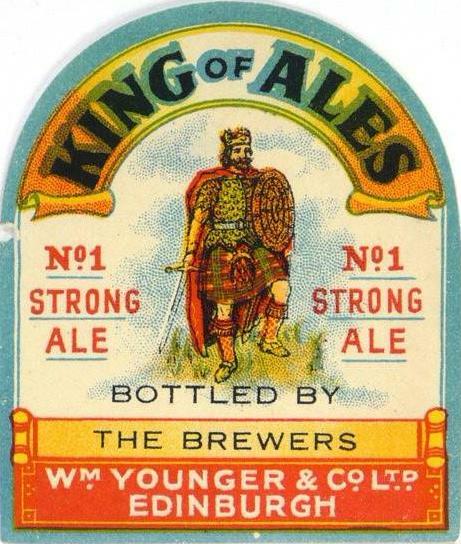 With its three imperial shitloads of hops and ridiculously low degree of attenuation, it’s typical of strong Scottish beers of the 19th century. William Younger brewed a crazy number of crazily high-gravity beers. They had two parallel ranges of Strong Ales, one with shilling designations, the other numbered. The numbered range seem to have been inspired by the Strong Ales of Burton-on-Trent. William Younger's brewing record held at the Scottish Brewing Archive, document number WY/6/1/2/28. I love the simplicity of Younger’s recipes from this period: pale malt and loads of hops. The majority from the US, but some Kent hops, too. Not much more I can say, really. I imagine the biggest challenge for you will be getting an FG that high. Though in the case of the numbered beers, the FG in the log may not be the real FG. In the case of the Shilling Ales, which were shipped in hogsheads for immediate bottling and rapid consumption, the FG probably is about right. While the numbered Ales might have been aged before sale. I simply don’t know. Did the same beer have a different recipe based on ingredient shortages or brewer changes? Have you encountered a recipe for Sparkling Ale by Younger around the turn of the century? Wahl and Heinus have a full analysis of one from 1901. It's interesting in that it's attenuation is almost 90%, starts at about 1.073 and goes down to around 1.007! It'd be interesting to see where it finished in primary compared to Wahl's final product analysis - may give some insight into where the numbered ales ended up at? "No long boils, normal fermentation temperatures and roast barley nowhere to be seen. And plenty of hops." You forgot to mention the peat malt. BrianW: what about caramelising a portion of the wort? there's nothing called Sparkling Ale in the logs. It could possibly be SE, though that's a little weaker at 1067. none of their beers from 1898 has attenuation greater than 76%. same recipe, different interpretation by Kristen. No idea where he got the Hallertau from. The original has a tiny amount of Spalt in it, but most of the hops are American.